Learn about the Central New York Housing Market through the eyes of the CNYAgent Realty Group located in Fayetteville, New York. 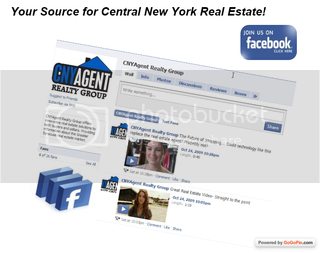 The CNYAgent Realty Group operates under Coldwell Banker Prime Properties which is one of the largest real estate brokerages in Central New York. Keep up to date on market statistics, new listings, real estate related articles, and videos. Become a fan today! Every quarter data for Fayetteville, Manlius, East Syracuse, Dewitt, Jamesville, Cicero, Clay, Liverpool, Brewerton, and Baldwinsville NY will be posted for Homes Sold in the 3rd QTR 2009.